American born Ajit Chauhan, based in San Francisco, is an artist attempting to subvert our sense of perception by reorganizing existing visual languages. For one of his most recent body of works entitled ‘ReRecord’ Chauhan uses old vinyl albums. 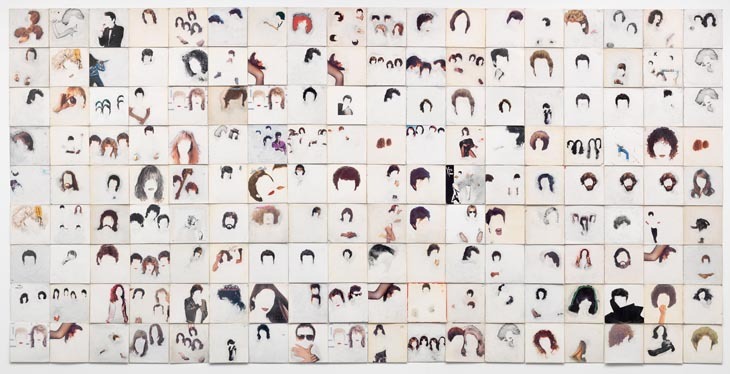 The work is composed of 160 erased record covers pinned together onto a wall, forming unresolved and slightly faded portraits that recall and highlight the ephemeral nature of things. The record covers can be seen as a marketing tool & a form of expression. They are an expression of marketing, which is playfully undermined. Chauhan’s unresolved portraits are rendered abstract and a reoccurring absence of detail unsettles any sense of something more substantial. Chauhan’s playfulness, upon what already exists, amounts to a work of delicate resolve and mild amusement.